Have I mentioned that my husband is a good cook? 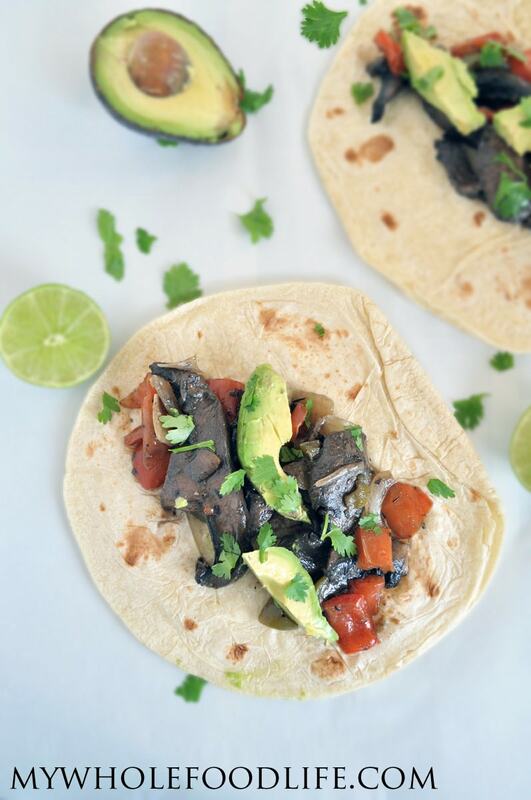 This mushroom and bell pepper fajita recipe is one of his creations. This is another one of his creations and also one of the most popular recipes on the blog. We have been using his homemade fajita seasoning ever since I posted this recipe. Homemade fajita seasoning is awesome because you can control the ingredients in it. These mushroom and bell pepper fajitas came out so delicious! Fajitas are so hard to photograph. I did the best I could. I hope they look yummy to you. These fajitas are vegan and gluten free. I topped them with my dairy free sour cream. It’s amazing. If you haven’t tried it, you should. It really taste like sour cream. Or at least what I remember sour cream to taste like. lol. And everything is better with avocado. Agreed? In a large saute pan , on medium low heat, add the ingredients, cover and simmer for about 20 minutes. Remove from heat and build your fajitas. I added the cooked mixture, sliced avocados, cilantro, tomatoes and my dairy free sour cream . Don't assemble the fajitas until you are ready to eat. The vegetable mixture should keep in the fridge for about a week. You can also freeze it for longer storage. Enjoy! These look delicious - can't wait to try them. Yes, EVERYTHING is better with avocado! Agreed! I hope you enjoy the recipe! Do you have any tricks or suggestions for the tortilla's? Mine break as soon as I try to roll them, they are so brittle. I have tried a few different brands without any luck!? I used Udi's brand and I had no issues. I have tried so many homemade fajita seasoning mixes and once, just once I found one I liked...and then proceeded to lost it never to be found again. Well, that problem has been solved! This recipe is delicious!! I did add 1 teaspoon coconut sugar per batch because the typical seasonings a wee bit of sweet to them, just ever-so-slight. THIS is my go-to fajita recipe! Thanks, Melissa!!! Yay!! So glad you liked it SaraAnne!